MAIN STREET, DONERAILE, CO. CORK. Doneraile, (between Mallow & Charleville), Co. Cork. - Saturday 4th or 11th May @ 12noon. Welcome to our Auctions Rooms in Doneraile. 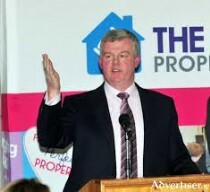 Aidan Foley has been running auctions since 1998 and has huge experience in this area. Items for sale are sourced mainly by word of mouth but we do get a lot of business from Solicitors/Executors, etc. WE HOLD REGULAR AUCTIONS IN DONERAILE CONSISTING OF APPROXIMATELY 500 LOTS FROM FURNITURE, CERAMICS, COLLECTIBLES, BOOKS, JEWELLERY, PAINTINGS, GLASSWARE, LIGHTING, ETC. Aidan starts selling at 1pm and is usually finished before 5pm, selling approx 120 lots per hour so there is no hanging around. Everything in the sale is consigned to us directly from house clearances and executor sales. We can organise collection for you should you have a house contents to clear. Price for collection will be given in advance. IMMEDIATELY AFTER THIS SALE AIDAN IS ACCEPTING ESTATE/HOUSE CLEARANCES FOR OUR NEXT AUCTION. AIDAN ALSO CONDUCTS INSURANCE AND PROBATE VALUATIONS. Auctions in Doneraile take place 4/5 times a year (Spring, Summer, Autumn & Winter) with approx 500 lots of nice Antique pieces together with Rugs, Irish and Continental Art, Glass, Occasional Tables & chairs, etc. THE CHRISTMAS SALE IS ALWAYS VERY POPULAR AND INCLUDES IRISH & CONTINTENTAL ART, SILVER, JEWELLERY AND LOTS OF INTERESTING GIFTS FOR YOUR FRIENDS AND FAMILY AT CHRISTMAS. Plenty again for every pocket. Auctions are a great way to furnish your home or rental property as there is something for everyone. Be sure to check out the Catalogue when its online. Aidan also sources furniture so email him with details and he will be happy to help you. This Auction rooms is nestled in the quiet village of Doneraile and 100m from Doneraile park. Its a great sale with only 500 lots on offer. Aidan starts his auction at lunchtime and is finished at approx 5pm. Lots include Occasional furniture, Light fittings, Sets of Ware, Fishing Reels/Tackle, etc, Books, Silver & Silver Plate, Glassware, Mirrors, Collectibles, Paintings, Prints, Memorabilia, etc. Plenty for everyones budget. Aidans auctions tend to attract lots of Interior designers looking for individual pieces that will enhance their projects. Most of the lots are pre-owned/pre-loved pieces looking for a new home. Our Catalogue will be online a few days before the sale and we will accept email bids up to 9am on the morning of the sale. A fully illustrated Catalogue will be online from Thursday evening and we will be accepting email bids up to 9am on the morning of the sale. Unfortunately due to the poor network coverage in Doneraile we are unable to guarantee receipt of bids after that time. Any queries can be directed to Aidan on 086 8290680. All items to be removed during these times, if you can't collect we can give you a name of local Couriers that can transport to you. Take the road for Limerick. Follow the signs for Doneraile. At Doneraile pass the Londis Petrol Station and take the next left roadway. Following the signs for Doneraile. Pass Doneraile Park on your left. At the end of the hill just on the bridge take a right to our auction rooms. IF YOU WANT TO RECEIVE A TEXT ALERT FOR OUR AUCTIONS. Once this Auction is complete we will accept items for our next sale.